Don’t stop what you’re doing, don’t go to your local game retailer, and don’t buy Aliens: Colonial Marines. You’ll hate yourself. The best part of my Aliens: Colonial Marines experience was after about the third time I had to restart this checkpoint way too far from where I died. I decided to stop playing for a second and grab a snack. In my pantry I saw these Oreos I got at the store the other day, but they weren’t regular Oreos. They were Peanut Butter Creme Oreos. I don’t know why I bought them, but it certainly seemed like a good idea at the time. So I grabbed them and hesitantly opened the package. Some things just don’t mix well together: oil and water, toothpaste and orange juice, my ex-girlfriend and I, or Gearbox Software and the Aliens franchise. It’s this weird push-pull between two forces that, on their own, are relatively good, but when combined together make something so abhorrently terrible bile stirs in your stomach and you fear — at any moment — you’ll throw up. The Peanut Butter Creme Oreos were alright, though. Aliens: Colonial Marines was touted as a canonical installment in the Alien mythos set between Aliens and Alien 3; I knew exactly what I was in for right around the time one of the marines said, “Stay frosty.” What followed was a five-hour slog through a series of references to the Alien franchise. There were no questions answered, nor any new lore uncovered. It was like riding through a museum of the best moments in Aliens, without actually watching Aliens. You know that part where the xenomorph baby bursts out of the guy’s chest in Alien? Or the part where they hold up in Hadley’s Hope? Or that fight with the xenomorph queen in the Power Loader? All of those moments are there for you to consume in Colonial Marines, but they’re all quite terrible. In fact, if anything, Colonial Marines only further complicates the timeline between Aliens and Alien 3 with cameos that make no sense at all. You can’t bring back a character from the dead and not explain how or why they’re there other than by saying it’s “another, longer story.” It takes the narrative from laughably bad, to almost offensively terrible. On top of all of this, you actually have to play the game. Xenomorphs are terrifying enemies. They lurk in the shadows and wait for the perfect moment to strike. They’re predatory creatures that bleed acid and are incredibly hard to kill. That’s how they work in the movies; in Colonial Marines they do the exact opposite. The way the AI is scripted to rush at the player and take them down with reckless abandon removes any tension in the action. The acid blood they poor doesn’t do any damage, and instead just pools up on the floor until it dissipates, leaving a slightly lighter grey texture behind. Playing a game with only one basic enemy type is boring, so the best thing to do is throw random human enemies in the mix. 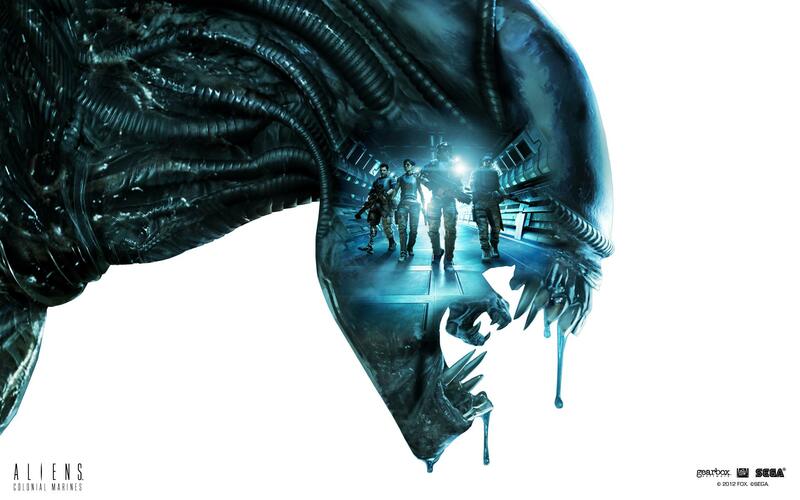 Throughout the campaign, players will fight four different xenomorph types that all look the same, and two different human types that all look the same. Suddenly you find yourself moving down the same-looking corridors fighting the same-looking enemies and start going crazy wondering what happened in your life to bring you to this point. One very ill-conceived stealth mission has you walk slowly through a sewer. If you make too much noise, exploding, zombie xenomorphs will hastily hobble towards you with some of the goofiest animations in the game. That’s about all the variety there is, since every other level just has you run through corridors and shoot things. Colonial Marines is a first person shooter that barely functions. The guns will shoot bullets, and those bullets will sometimes hit enemies, but those enemies almost never react to damage of any kind. You’ll pick up different weapons that totally look like weapons from Aliens, and that’s cool for about five minutes until you quickly realize you’re just going to use two weapons through the entire game with very little variety between them. Gearbox strives to recreate iconic locations from the movies and they do a pretty good job. But the work that goes into making those environments is all for naught when they look downright terrible. Textures take a long time to load in, and look incredibly low-res once they finally do. Character models are blocky, dead-eyed, poorly-animated eyesores that barely look like the people they represent. All of it combines to make a game that barely looks better than Duke Nukem Forever. The lack of polish doesn’t just end at the environments. Technical bugs are the true horror of Colonial Marines. Enemies will randomly start phasing through each other or otherwise act in spastic, haphazard movements; scripting errors will cause progress halting bugs, and guns will cease to fire. Players can simply walk through friendly character models and environmental objects. It all screams unfinished. If all of that doesn’t detract you from purchasing Colonial Marines, a few multiplayer modes are offered to those brave enough to try. The full campaign can be played with four player co-op, so if you hate yourself and your friends, you can all play together! However, co-op seems to be added as an afterthought since most of the tight, corridor-driven environments don’t lend themselves to four players. Competitive multiplayer pit marines against xenomorphs in various modes that all pretty much devolve into a team deathmatch. The marines play just as they do in the single-player, if not a little faster. Playing as a xenomorph is where things get tricky. It’s an interesting concept to play as a creature that can climb on walls and ceilings, but Colonial Marines doesn’t do a good job implementing it. Xenos are incredibly easy to kill, forcing them to play a more stealthy role in the battle. Soon you’ll find yourself wondering if it’s really worth it since the lack of attack variety means xenos need to get up close no matter what, leading to their death more times than not. Aliens: Colonial Marines is a terrible game. After six years, you’d think something good would come of it, but no amount of fan service or love of the Alien franchise can fix how horribly broken it is. The story is boring and the game is so wrought with technical issues it’s never fun to play. The only thing Aliens: Colonial Marines did was make me want to watch Aliens and forget this game ever existed. So sad, this was a very long awaited game. The only words that come to mind are epic failure!